Following the federal anti-tobacco law announced last year, the UAE Ministry of Health (MoH) is currently working on implementing the framework and executive by-laws for tobacco control in the country by developing various strategies to cut the consumption rate and reduce the demand for tobacco products. Health officials at an anti-tobacco workshop held by the MoH in Dubai, in tandem with the World Health Organisation (WHO), on Monday said that the ministry will ensure optimal application and implementation of the national anti-tobacco law to regulate the use of tobacco products in the country. The WHO delegation is currently on a visit to the UAE to evaluate the anti-tobacco programme and review procedures taken by the local authorities to control tobacco use. President His Highness Sheikh Khalifa Bin Zayed Al Nahyan issued the National Anti-Tobacco Law on Jan.6, 2009 aimed at building a tobacco-resistant generation in the country. Speaking at the seminar, Dr Hanif Hassan, the Minister of Health, said that the UAE’s draft anti-tobacco law had been announced years ago and the implementation of the federal law of 2009, in accordance with related studies on the legislation, will safeguard public health and have a great impact. “The UAE spares no efforts to review and enact the legislation and by-laws, in cooperation with the competent authorities. The younger generation will be educated on the adverse effects of tobacco use and on the necessity of health protection, reduction of healthcare burdens, as well as economic, social and environmental impacts of the harmful behavior,” he added. According to Dr Hassan, the law aims at complete elimination of tobacco usage and consumption by the community members by encouraging smokers to quit smoking. Dr Salem Al Darmaky, Acting Director General of the MoH, said the federal anti-tobacco federal law consists of 22 articles, in addition to more annexes and explanations on some articles. “Certain articles discuss the standard specifications of tobacco products, packaging and labeling of tobacco products, images and health warnings, permissible level of nicotine content as well as other items need more clarifications and explanations that can be easily implemented in reality,” he explained. Darmaky added that the regulations have not been designed to destruct related business activities, but to construct a tobacco-resistant generation in the country. “All sorts of materials and strategies to promote tobacco products or smoking habit, through direct or indirect advertising, have been prohibited under the law,” he said. "The companies or individuals, who promote the tobacco products or advertise them in any way, will be convicted. Their publicity tools and materials will be confiscated in addition to closure of the firms," pointed out Dr Darmaky. Dr Mahmoud Fikry, CEO for Health Policies at the MoH said that different forms of tobacco and its consumption methods have become an addictive habit and part of part of customs and values of many communities. “Tobacco production companies promote the smoking and employ their marketing experts in order to ensure the continuous increasing incomes. So, the law will face this attitude that actually risks the public and private health,” he added. Dr Fikry hoped the new law will help reduce the rate of smokers in the country as well as lessening passive smoking effects. “The anti-tobacco team at the MoH would pursue its activities to educate members of the public about health risks of smoking and the new law and its provisions,” he said. Dr Wedad Al Maidoor, Head of the National Tobacco Control Committee at the MoH and Director of PHC in Dubai Medical District, said that the rate of smoking among adults in the UAE is 24 per cent as per the health survey conducted in 2003, and it’s the major contributor to deaths caused by cardiovascular diseases in the country. 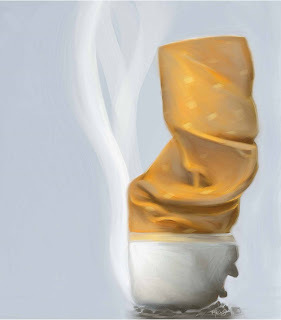 The lung cancer deaths comprise 14 per cent of deaths caused by cancer. “The tobacco consumption rate in the Gulf region has become an economic, social and health burden for more than 50 years due to the rapid and continuous phenomenon of smoking cigars and Shisha,” she added.